The snowpack for the state of California—a critical source of drinking water for the state—hit its lowest level in the last 500 years, according to a study published yesterday in Nature. When the snowpack was measured in April—historically the high point for the season’s snowpack—it was just 6 percent of average for the past century. Now, thanks to this latest study, we know that the snowpack hasn’t been this low in at least five centuries. The study used tree-ring data from centuries-old blue oaks to provide historical context for this year’s extremely low snowpack. The paper is the first of its kind in describing temperature and precipitation levels in the Sierra Nevada “that extends centuries before researchers started measuring snow levels each year,” says The New York Times. Last winter was the hottest on record for California, so the little precipitation the state received often fell as rain and not snow. This has grave implications for the state’s water supply because snowmelt provides one-third of the state’s drinking water and is also critical for fighting the state’s increasing wildfires. California is in the midst of a four-year drought that has produced devastating wildfires like the Valley Fire in Northern California, which is happening right now. This past spring, NASA scientist Jay Famiglietti warned that Californians only have one year of water left in the state’s reservoirs. To determine snowpack levels that far back, researchers combined two data sets of blue oak tree rings. “The first set provided historical precipitation levels from more than 1,500 blue oaks from 33 sites in California’s Central Valley,” explains The Times. “The team compared part of that data from the years 1930 to 1980 with actual snowpack measurements and found that both findings matched. 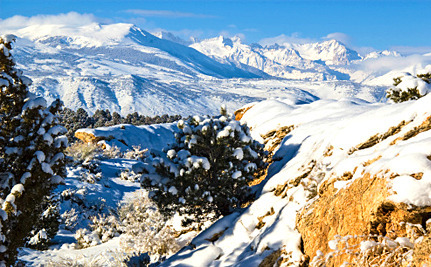 Using this correlation, the team combined the precipitation data with a second data set of tree rings that looked at winter temperatures from 1500 to 1980.” Based on the 500-year record, researchers estimated the odds of such a low snowpack happening more than once over that time period were less than five percent. While the April 1 assessment finally goaded state officials into action with Gov. Jerry Brown issuing the state’s first-ever mandatory water restrictions, many scientists saw this coming. Peter Gleick, president and co-founder of the water policy-focused Pacific Institute began investigating the impacts of climate change on California’s water supply 30 years ago. “It’s shocking in a historical context because we’ve never seen this bad of a snowpack. It was not shocking in the sense that we sort of knew this was coming, and we just didn’t know when,” Gleick told Climate Central. “This is the new unpleasant reality” for Western water, not just California. And don’t expect the strong El Niño to “solve the drought” as warmer Pacific Ocean waters are expected to bring lots of precipitation to California this winter. Even if the state receives the much-needed rainfall, the storms might not produce a larger snowpack. If temperatures remain above-average as expected, much of that precipitation could fall as rain and not snow even at higher elevations—just as they did this past winter. Furthermore, Kirsten James at Ceres explains that because of climate change and poor water management, El Niño—not even a Monster El Niño—can’t save California from its epic drought. Maybe this will help us prepare for the next solar minimum. More evidence of Global Warming. California will have to in addition to growing cactuses and natural drought resistant plants on their front and back yards, replace their monoculture with dry farming. They must stop diverting water from the Sacramental delta, and other natural rivers for agriculture, and grow only natural drought resistant plants. Rainwater collection systems should be put on every home, along with composting toilettes to reduce water usage. They will have to learn to adapt to having a very low supply of water. It is truly amazing that when faced with the truth, some people will still not comply. California had been blessed with abundant rainfall for an unusually long time. Now, when reality strikes, there are those who refuse to accept it, just like George Santayana's famous quote, those who fail to learn from history are doomed to repeat it. I am the father of a resident of CA for the last 25 years and a 'now' American citizen. My wife and I keep visiting this country on an average every 2 to 3 years, to spend some time with his family. The severe drought conditions this year shook us all. We went to see lake Mead and were shocked. BUT THESE WERE TO BE EXPECTED IN NATURES CYCLE. Met a few die hard Americans. "Huh! this water shortage is all bunk. They ask us to reduce 30% and we did. What more do they want." Goodness. I saw that they only did it under legal pressure, They had no concern for the falling snowcaps,which were acting as water reservoir. They had no concern for the falling sub terrain water levels. They were only bothered that we may be penalised. AND these people called themselves literate, sincere Americans and mor so humans. Our snow pack in WA State is very low also.